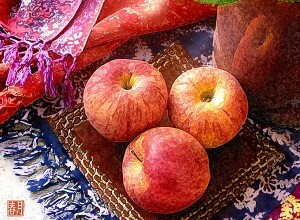 Cameo Apples ~ Colorfully striped, crisp, sweet autumn treats celebrate the season with each bite. I wanted to interpret the image more artistically than a conventional photographic still life. Via digital manipulation experiments, discovered an interesting image texturing technique that reminds me of batik fabric patterns.